Right now, Bartolo Colon is one of my favorite New York Mets players – he’s nearly three years older than me and could not look less like a professional athlete if he tried, but he was an All-Star and runner-up in the American League Cy Young Award voting last year. There are good reasons to doubt whether Colon can duplicate his success away from the Oakland-Alameda County Coliseum O.co Coliseum’s spacious foul territory, but that’s something Sandy Alderson can worry about now and the rest of us can think about in April if we need to. 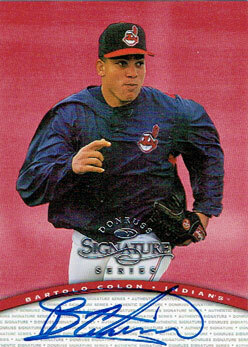 Colon began his career 16 years ago with the Cleveland Indians as a 24-year-old rookie, and he certainly looked different then than he does now. He could potentially earn his 200th career victory in 2014, and is likely to reach 2,000 career strikeouts. Those aren’t Hall of Fame numbers by any stretch, but that is the record of a pitcher who’s had a very good career. 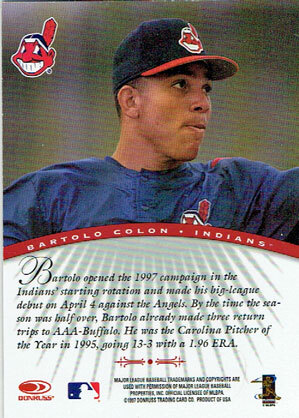 Beckett Media identifies 19 different Bartolo Colon baseball cards with certified autographs, but most date from his days as a prospect or his early career with Cleveland. This is the most common version of a card from the 1997 Donruss Signature Series set. If you look around, you can find one for around $5. You can follow Paul’s Random Baseball Stuff on Facebook or Google+, see my photos on Flickr and Instagram, and follow @PaulsRandomStuf on Twitter, where I talk about about a variety of things in addition to baseball. Colon should put up good numbers. Citi Field isn’t exactly a hitter’s park and there’s no DH in NL. I’m curious to see how he looks swinging the bat. I am too. I’m concerned about the how he will do with less foul territory, but I do think he’ll be a better signing than Shaun Marcum was last season. Enjoy the “favorite because he’s older than I am” feeling… I lost my last guy when Jamie Moyer retired. I think Colon’s a good acquisition if only because you’ve got to take some chances with guys like that. I was not happy to see Moyer & Omar Vizquel call it quits – they were the last two who debuted in the 1980s. I’ve got – at best – maybe 5 more years of players who are older than me. With the end of the steroid era, it’s probably more like two or three more years.